Riparian areas are the transitional zones that are found along our streambanks, lake shores and wetlands. Often described as "wetter than dry", but "drier than wet" these areas develop unique plant communities. Healthy riparian areas may have any combination of trees, shrubs, grasses, depending on the local conditions. They produce vegetation that is more lush than the surrounding dry land because of better soils and water availability. Healthy riparian areas have many important functions in our watersheds. Trap sediment: Riparian areas slow the flow of water, helping to ensure that sediments settle out before they reach the water course. Filter and buffer water: In addition to removing sediments, riparian vegetation can also trap nutrients and microscopic pathogens that are present in runoff. Studies have shown that a high percentage of pathogens and pollution-causing nutrients in runoff water can be removed by healthy riparian "buffer zones." Build and maintain streambanks: by trapping sediments and anchoring soils with their extensive root systems, plant communities help ensure that streambanks do not erode excessively. Store floodwater and energy: Flooded riparian areas act like a safety valve in the watershed because they slow water flows, reduce the size of a flood further downstream and the destructive power of fast-flowing water. When water speed doubles, its ability to erode increases four times and its ability to carry sediments increases sixty-four times. Recharge groundwater: Riparian areas can help to maintain local water tables. Maintain biological diversity: In the prairie landscape it has been estimated that riparian areas, which make up less than five percent of the land area, hold the majority of the remaining biological diversity. In some regions, riparian areas are the only remaining natural areas. Create Primary Productivity: Riparian area vegetation can be harvested in a sustainable manner to provide products such as forage for livestock or high-value hardwood lumber. What is a Healthy Riparian Area? Simply put, it is a riparian area that carries out the ecological functions described above. In a healthy riparian area there is vigorous growth trees, shrubs or grasses, stream banks are not eroding beyond what would be considered a normal amount, disturbance by humans or livestock is not excessive, and the watercourse can spill water into the riparian vegetation during a normal flood event. Some of the key signs that point to the loss of riparian area health include the loss of natural vegetation (quantity, numbers of species and width of the riparian zone) and excessive erosion of the streambanks. Given that riparian areas are crucial to the health of our surface waters and they are often our only remaining natural areas in some regions, it is especially important that appropriate land use practices are used to maintain or enhance their functions and values. Wetlands occur in many forms, but the common feature is that they are water bodies which go dry from time to time. The frequency of drying or flooding is one of many factors that determine what kind of wetland will result in a particular area. Manitoba has one of the highest densities of wetlands of any province in Canada. What kinds of wetlands do we have? Prairie potholes: Across our agricultural landscape, high densities of wetlands were left behind by retreating glaciers. These small, shallow wetlands may not have water for very long periods, but they help to control flooding and are key habitat for waterfowl and other prairie wildlife. Manitoba has lost 40% to 70% of these wetlands since the beginning of European settlement. Riverine wetlands: Wetland areas can be found on the margins of rivers and lakes. Delta wetlands: River mouths can create conditions that produce wetlands. The Saskatchewan River Delta, in Manitoba and Saskatchewan, is the largest freshwater river delta on the continent. Fens and Peat Bogs: Southeastern, central and northern Manitoba have extensive wetland areas have accumulated peat deposits over time. Vegetation can include sedges and grasses, mosses, shrubs or black spruce. Peat extraction industries operate in Manitoba bog sites. Coastal wetlands: Manitoba has large areas of salt water wetlands that are influenced by the ebb and flow of sea water along Hudson Bay. These wetlands are important to nesting and migrating waterfowl, especially Canada and snow geese. Water quality: Wetlands have often been called the "kidneys of the landscape" because of their ability to filter surface water. If water carrying silt or other sediments flows into a wetland, much of that material will settle out before that water leaves the wetland. The vegetation growing in a wetland can also take up nutrients and contaminants that may be dissolved in the water. Flood control: Wetlands generally are at their lowest levels in winter, which means that they have the capability to store large amounts of melting snow and runoff. Watersheds with wetlands will have less flooding than watersheds where wetlands have been drained. Certain wetlands can also recharge groundwater. Habitat for fish and wildlife: Acre for acre, wetland habitats are among the most productive natural areas in the landscape. That productivity results in habitat for a wide range of birds, mammals, reptiles, amphibians, fish, invertebrates and plants. A vast array of fish and wildlife depend on wetlands. Many fish species need wetlands for spawning habitat and nursery areas for young fish. More generally, the water quality improvement functions of wetlands helps to ensure that surface water quality in lakes and rivers is sufficient to maintain aquatic species. Hundreds of species of birds, especially waterfowl and other water birds, depend on wetlands for at least part of their life cycles. Prairie potholes are especially important to continental waterfowl populations. Agriculture: Wetlands can be an important water source for agricultural industry, especially livestock producers. Wetlands are also important forage sources for cattle, especially in drought years. Economic Development: Hunting and trapping activities associated with wetlands can be locally-important generators of economic activity, especially in rural and remote areas. 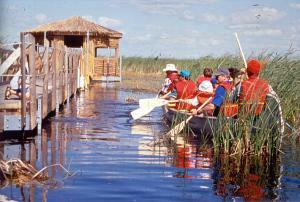 Ecotourism opportunities have been developed around wetland areas such as Oak Hammock marsh. Climate Change: Many wetlands are recognized as important carbon "sinks", which is a key element of controlling emissions of carbon dioxide and other greenhouse gases.